This weekend the younger divisions head north, south and west for lots of stakes action and more second-half season prestige. Weekend features begin in New York at Vernon with the launching of the traditional Kindergarten Series legs for frosh trotters of both sexes. The weekend stakes end in New York at Tioga on Sunday, Aug. 28 with soph trotters. On Aug. 28, all races at Tioga earn a TwinSpires player 10X points—10 points for every dollar wagered. The classic “Zweig” stakes is included on the program, bringing together the Hambletonian-class and “Oaks”-class groups. In the middle of the New York, to the north features are stakes at Mohawk and in the Midwesk, a pair of them surface at Balmoral. Let’s get to the suggested contenders in all of the weekend’s presentations. On Monday, Aug. 29 the “standardbred equivalent” to Zenyatta, See You At Peelers, is set to come from post 9 in the Nadia Lobell at the Meadows, looking for her 23rd-straight win. Friday, Aug. 26, Vernon is the latest home for the Kindergarten Series launch, offering the first program of divisions (others will take place at other tracks). In frosh-colt-trotting action, undefeated Vic Smith should be challenged by our choice, Big Chocolate. He has been racing in the same company as “Vic” but will not be the favorite in this small field, the first division. A Penny Earned will mount a ton of support in the second split but Blazed should go two for two for the Antonacci family as a second choice in the wagering, which is also our choice. The third colt split must belong to the Bruce Saunders-trained Highland Yankee, a first-time starter with a qualifier faster than all the others in the field. It’s an instant play if you agree to what should be a very low win mutuel. Taxman is the horse to watch for an upset in here. He was hung in a New York Sires Stakes event where betting was prohibited. He lost positioning in the stretch but came back to finish second. He may adapt well to the seven-eighths oval. Filly trotters are next, all of them maidens, and the Antonaccis should have the edge with the Donato Hanover gal Alexandria Lindy. Angel Eyes Hanover is one to watch. She worked for the lead in the stretch and cleared approaching the clubhouse turn at Chester. She dueled around the far turn and gave way to Playwear Hanover and had to settle for second. She may do better this week. Then, in filly-division two, Pretend To Be Nice has a mark on a half-mile track and could be overlooked by “speed players.” She is from good connections that are having national trotting stakes success. Sandra Volo could be the betting choice. She won a Stallion Series division at Chester at 26-1. Finally, in filly-division three, a Chocolatier first-time starter, Mrs D, has been qualifying like she wants to add to the sire’s great frosh-filly roster of success (remember Crème De Cocoa, to name one). She gained 16 lengths in a qualifier and trotted the mile in 2:01.2. Take a shot with her. Holier Than Thou deserves some attention, too. She was hung last out and did not fade, so she could be coming up to a good effort. On Saturday night, Aug. 27, Mohawk activates the frosh festivities with elims for the big purses in next week’s Metro Stakes (the pacing colts) and She’s A Great Lady Final (the filly pacers). A score of semi-green colts wish to advance to the million-dollar final, so three elims will adorn the program. In the first Metro elim, Major Bombay will be the likely odds-on favorite. But be warned we don’t respect him as much as many others. The Woodrow Wilson win completely set up for “Bombay,” allowing for him to make a move less impressive than it looked. D Terminata knows the Mohawk surface well and is the one to watch. He lost by a neck to Hurrikane Kingcole, who paced the fastest Nassagaweya division last week. Post 7 should be no problem for him. In the second elim, Speed Again and I Fought Dalaw will be the top betting interests. Shakerattlenrock is the horse to watch. The full brother to Pretty Katherine paced an impressive mile in the Nassagaweya but lost to Speed Again. “Shake” had to wait for room to circle out and was charging after “Again” but had to settle for second. In the final elim, Mel Mara, Hurrikane Kingcole and Special Blend should all be bet well. Allstar Legend, however, will be under bet and is the horse to watch. He gapped cover in the “Wilson” and still made a huge close to finish fifth. In the first She’s A Great Lady, American Jewel is the one to beat. If she is a fair-priced favorite, use her. If she is not, stay away from the race. In the only other elim, the Sweetheart champion Pirouette Hanover is the likely favorite. Podges Lady made two moves in the Sweetheart, one to take the lead and the other to survive first-over pressure, making her the horse to watch. For years, many of the best horses have made one of their stops the American-National stakes in Illinois. This year the stars feature Crys Dream, Lady Rainbow and Wincinnatti. In the $121,500 three-year-old filly American-National, Crys Dream will be heavily bet. But Lady Rainbow could be ignored as is often the case. 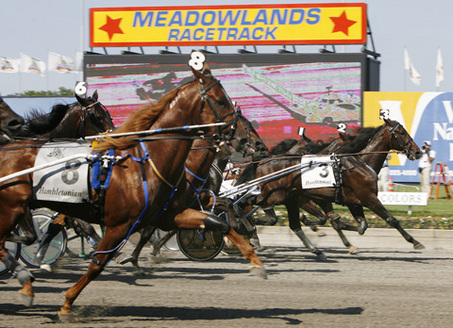 She was blind-switched in the Hambletonian Oaks and still made a late trot to finish second. She may be the best. In the $108,500 three-year-old colt American-National, Whit and Swan In A Million will be bet. But for value, GJ Photo Victory may bring a price. He beat Illinois’ best trotter, Anthonyskywalker, at Springfield. “Victory” gained 14 lengths on the fair mile and won by 11. He may do even better at Balmoral. Some of the Hambo cast returns to Tioga on Sunday, where TwinSpires players get 10X points for every dollar wagered on the program. The feature is the Dr. Harry Zweig Memorial. This event was traditionally the week-after-the-Hambo stakes for this division, when the race was held at the Saratoga, N.Y. fairgrounds. Now it is the feature after The Colonial but still offers a big purse. 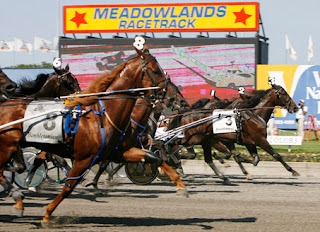 This year it is estimated at $235,000 and Hambo-champ Bold Bahn is set to return in another joust with Manofmanymissions. This time, Charlie De Vie is also scheduled to race (he didn’t make the Hambo final). The Oaks winner, Bold And Fresh, is reported to be the headliner of the $120,000 (set.) filly “Zweig.” Since no draws were made by press time, please watch our Twitter page for recommendations. 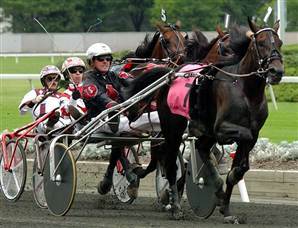 This stalwart batch of older pacers pound the ovals weekly for the best money in town and here they are doing it again, this time in Canada, earning their berths for the Canadian Pacing Derby Final next week with two elims on Aug. 27. We have to love Foiled Again one more time. He was part of our upset exacta with Alexie Mattosie on closing night the Big M and he was closing near well enough to win and pay more than he ever should pay. He may be a price here, too, in the first elim. The second split is a great place for Aracache Hanover to extend the early foot he displayed last week in New Jersey. Mohawk is a better track than Woodbine to rate a mile wire to wire; so, we feel this guy has a shot at it over the obvious choices. Eliminations are the events for upsets than finals, considering the best horses can lose an elim and still get to the big show. These veterans are well aware of that.